Ron Palmese has learned the value of speaking up when he wants something. If he hadn’t, he wouldn’t be a general counsel. Palmese, vice president and the first general counsel of Shake Shack, says success is about not being afraid to seize an opportunity when it presents itself. After eight years at a law firm following the path to make partner, Palmese decided he didn’t love firm life enough to stay in the game. He moved on to Union Square Hospitality Group (USHG), the owner and manager of a number of well-known restaurants in New York City. At the time, USHG also owned and managed Shake Shack. The restaurant chain originated as a hot dog cart and supported the rejuvenation of Madison Square Park through the park’s conservancy. Palmese was the first general counsel the company ever had. “There was a lot of foundational work to be done, a lot of process creation,” Palmese says. He spent his first two years creating those processes, all while Shake Shack was growing. By spring 2014, the company’s leaders were thinking about taking Shake Shack public, and they put Palmese in charge of the initial public offering process. In preparation for the spinoff, Shake Shack’s chief executive officer, Randy Garutti, hired a chief financial officer, a vice president of information technology, director of marketing, director of real estate, director of supply chain, and director of licensed business. The role of general counsel was the only one that hadn’t been filled yet. “I said to myself, ‘If I don’t ask now to be general counsel of Shake Shack, then the opportunity might just pass me by,’” Palmese recalls. His bosses at USHG, including founder Danny Meyer, supported the move, even if it meant Palmese would be leaving them to go work exclusively for Shake Shack. “I thought it would be a lot harder than it was,” Palmese admits. In January 2015, he made the move and has loved every day of his new job. The public offering was a success—Shake Shack’s stock rose 123 percent by the end of the first day of trading. Leading a public company has opened up new doors for Palmese professionally, and he has gotten to be a part of a company that is rapidly growing. 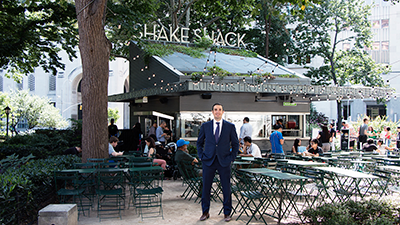 In his job at Shake Shack, he is constantly helping the business succeed in a variety of ways. One moment, he could be reviewing a contract; in another, he could be dealing with an employment or intellectual property issue, he says. That excitement helps inspire the workforce. “The love that people have for this company compels them to work as hard as we do. You can feel the passion across all positions and tenure,” he says. Whether it be with his colleagues in the home office; employees in the Shacks; or his international partners in Japan, Korean and the Middle East, Palmese develops relationships with all of them. “One of the keys to our department’s success is gaining the trust and respect of the individuals we work with,” he says. He acknowledged that some people might feel uncomfortable asking for a promotion or new responsibilities, but said asking for what he deserved has reinvigorated his career.